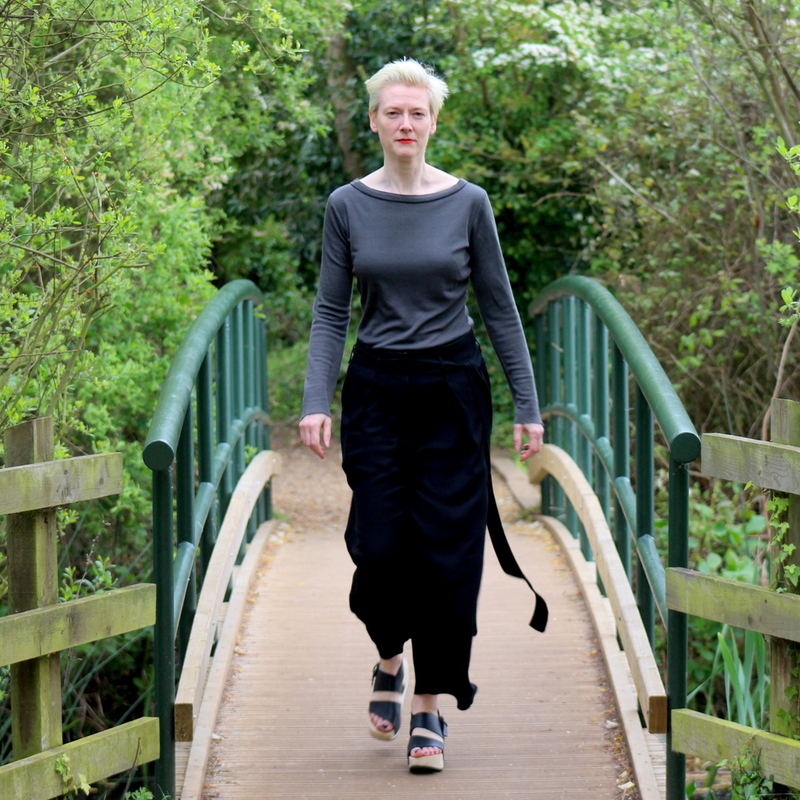 I’ve made these trousers once before but you always tweak a pattern second time around don’t you? I always seem to anyway. 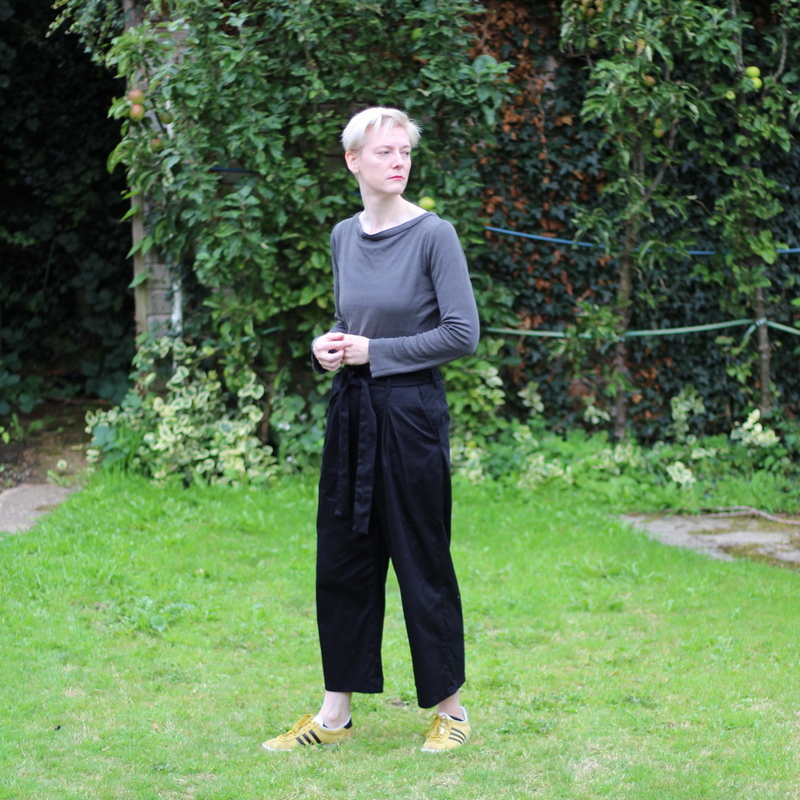 They are Burda 118 09/2015, wide legged menswear style trousers with turnups. The first version was a little too big in the waist. Perhaps because they rode lower than intended they also seemed slightly too long. This is a Tall pattern to start with and I didn’t add any length. For this pair I took in the waist and left the length alone, and they’ve come up a fraction too short. It’s not enough to make me unstitch the turnups and let them down, but next time I’ll add a very little to the length, maybe 2cm. There probably will be a next time although not for a while. This view shows the pleats and the very forward position of the side seams. When I took the waist in I did it by removing width just from the back pieces. There’s no space to take it out of the front. The fabric is a really lovely black wool flannel from Croft Mill with a little bit of elastane in it. It isn’t enough to make it stretchy but I guess it helps reduce creasing. Sadly it’s now sold out. The pocket bags are a scrap of heavyweight black satin lining I had left over from another project, and I used Vilene G700 interfacing. The pattern calls for interfacing on the waistband, welt pockets, and fly shield. I also put it on the front pocket edges but I still managed to stretch them out a bit. These are practical trousers. The pockets are huge and they’re very comfortable and warm. But I like to think they’re a bit stylish too. I’ve mainly been wearing them with this black wool jersey t-shirt but I think they’d go with a short boxy top as well. People talk a lot about finding TNT (tried and tested) patterns; ones that fit beautifully and get made again and again. I don’t have any TNTs and most of the time I don’t want any. But every so often I think it would be nice to have a standard skinny jeans pattern that I could cut out and make without too much thought about fitting. A few years ago Burda did a pattern for what they call ‘five pocket trousers’ which is exactly the sort of thing I’m after. It’s available here as a PDF, or style 115 from March 2014 if you have the magazines. I think they’re pretty good for a first try. The shiny fabric shows every single wrinkle so the photos are not flattering the fit. I made my usual Burda adjustments (trace a size smaller for the waist and add 5cm to the leg length) and also changed the waistband from straight to curved to try to avoid gapping. That wasn’t enough to accommodate the big difference between my waist and hips, and next time I might take the waist in a bit more. I’d also prefer a wider waistband. I had to use a walking foot to top stitch the fly front, and also when stitching in the ditch to secure the waistband. The hems were hand sewn because I wanted a good finish and even with the walking foot the fabric dragged a little; you can’t pin this stuff without leaving permanent marks and you certainly can’t unpick so I didn’t want to risk machining the hems. I still haven’t got my hands on a Teflon foot but I hear they are a good solution. Installing the zip without pins was also tricky; wonder tape helped a lot there. If I was making these in a stretch woven as intended I think I’d try making a full calf adjustment as they are noticeably tighter there. The pockets have come out surprisingly well. The pocket lining is a scrap of heavy polyester stretch satin I had left over from another project. Normally I’d use cotton poplin for lining jeans pockets but I thought the stretch factor of the satin would be more compatible with the scuba. So overall a success. Haven’t quite dared wear them to work yet but they are good for weekends. I’m going to make the pattern in stretch denim next. Style Arc Genevieve coming up next! Ages ago I had a pair of wet-look leggings from Topshop that I wore under skirts and dresses to add a bit of interest. They were always slightly too small for me, and the seams strained alarmingly from day one. Pregnancy finished them off completely. Just before my baby arrived I bought a length of wet look scuba knit from Tia Knight so I could replace them. It’s been over a year now and I have finally got around to sewing the fabric up! The exact same product code is no longer available, surprise surprise, but this one looks very similar and I think the product photo is the same as the one in my order confirmation. The pattern is Burda 130-01-2011, a very basic leggings pattern. There is just one pattern piece on this view; not even a separate waistband. The pattern has a second view which has an overskirt added to the design. Not something I intend to use any time soon but it makes it a little more versatile. It’s designed for stretchy knits and my scuba is fairly stable so I measured the flat pattern carefully and sized up quite a bit; I’d normally make a 40 on hips and legs and what I ended up with was more like a 44. One adjustment I didn’t need to make was length. I am tall and yet the standard length on this is more than enough for me. Perhaps they are meant to be worn scrunched up? Worth checking if you make these yourself. I didn’t hem mine but even allowing for that they are too long. The fabric was a challenge to sew. My sewing machine could not feed it at all if the coated side was in contact with either the foot or the feed dogs. I ended up sewing the waist casing on my overlocker because I couldn’t get it through the regular machine. I did it the way you’d sew a hem on an overlocker: folding the fabric as you do to use a blind hem stitch on a regular machine and using a flatlock stitch to catch the raw hem edge to the fold. It’s not at all beautiful and the elastic tends to twist, but it was better than nothing. Another time I’d make a completely separate waistband piece and overlock it on. And I’ve since picked up some tops for sewing pleather type fabrics from Alex; that’s a good thing as I have quite a bit of the scuba left over. For what it’s worth I used size 90 needles on the overlocker with this, and on the regular machine a size 100 ball point, which worked fine as long as I only sewed the fabric with the wrong side out. 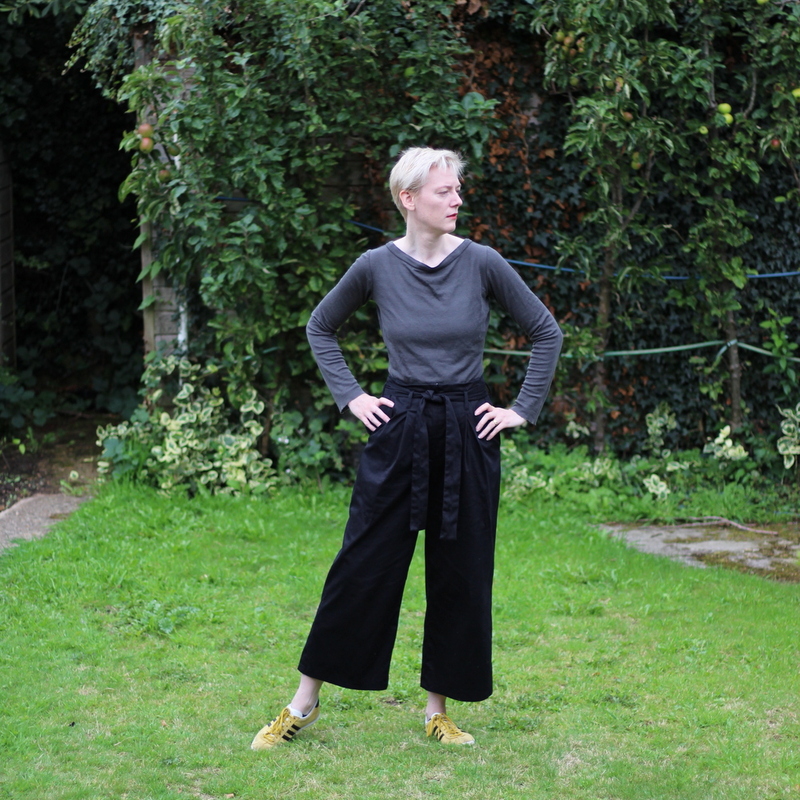 The fit is OK – which is to say not brilliant but considerably better than my Topshop leggings. The front crotch depth is too long and the waist could do with being a bit smaller. There’s a reason I’m wearing a long top in the photos. But I would never wear these in real life without something over the top that covers my bum so I don’t think it’s really cheating. These aren’t the greatest thing I’ve ever made but they fill a wardrobe hole and didn’t take long. If anyone’s wondering what happened to my Style Arc jacket I did finish it but it took forever to get photos…watch this space. I should know this by now, but it&apos;s amazing the difference fabric choice makes to a pattern. 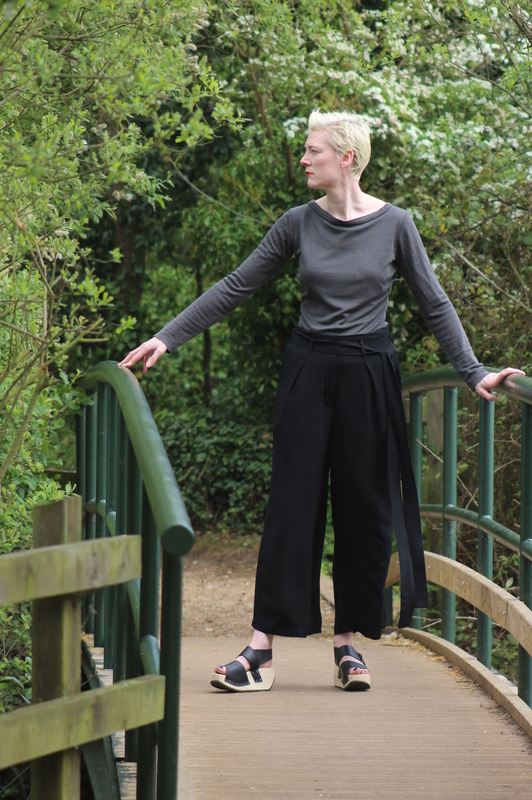 Earlier this year I made Burda&apos;s 104c-02-2017 culottes pattern in a drapey viscose crepe fabric. Not at all the recommended fabric for the pattern, but the end result was great and I&apos;ve worn them a lot. So I made them again, this time in a stretch cotton sateen from Fabric Godmother. This fabric is much more the sort of thing the pattern designer intended. The pattern specifies "lightweight trouser fabric with some body". The originals were a little large so I took the waist in slightly as well, and here&apos;s the end result; you wouldn&apos;t think it was the same pattern. And here is the viscose crepe pair for comparison. I seem to have worn the same top for both sets of photos: not intentional. In the spirit of full disclosure I should say that the sateen pair were worn and washed several times before we got around to taking pictures, and were put on straight from the drying rack without ironing, whereas the viscose pair were photographed in their &apos;just finished&apos; state. The viscose pair sit much lower on me and have a nice swish, but feel a bit big. The crepe tends to grow with wear which doesn&apos;t help, although a wash shrinks them back to the original size. The sateen pair feel much more structured and look slightly shorter because they sit higher. The shinier fabric means they tend to show marks and creases more easily than the crepe ones. The pattern has fake back pockets which I skipped on the new pair. They were a pain in the neck to sew on the originals and I wasn&apos;t happy with the positioning. The trousers look OK without them I think. The sizing on the new ones is better but still not quite right. They fit at the waist now but seem slightly too small on the bum. I didn&apos;t change the pattern there so that&apos;s just the effect of different fabric. This pattern has lots of belt loops, which means there is a very long thin tube to turn inside out. Not my favourite sewing activity and not easy in a fabric with body. I tried a new-to-me technique involving a chopstick and a straw. I was cynical about it before I started but it worked! You sew up one end of the fabric tube, poke the straw into the tube, and then push the closed end through the centre of the tube using the chopstick. I can&apos;t find the instructions I used now but this article covers the technique: https://angelleadesigns.com/tutorials/how-to-turn-a-narrow-tube-of-fabric/ . I suspect it relies on the straw being an appropriate diameter for the size of tube. My straw was narrow and I think it would have failed on thicker fabric. The belt came out the right length this time. On the previous pair it was extremely long which looks good in pictures but is a pain in the neck to wear. I must have cut it on the fold by mistake or something like that. In fact the whole waist area is better in the sateen. Again it&apos;s the effect of using crisper fabric. There is no waistband, just a facing, and it needs some body and a lot of tacking in order to make it stay put. I stitched my facing down in the ditch of the side and centre back seams on both pairs but I should have done it at the pleats and darts too. I&apos;m very happy with both of these. Both are in high rotation at the moment. Culottes are something I never imagined I’d want to wear. I hesitate to say they’ve come back into fashion because I wouldn’t know, but they have certainly started to look appealing recently. It may just be the effect of swapping fashion magazines for Burda and pattern catalogues. These ones are Burda 104C 02/2017. They are a very high waisted style with front pleats and a tie belt. 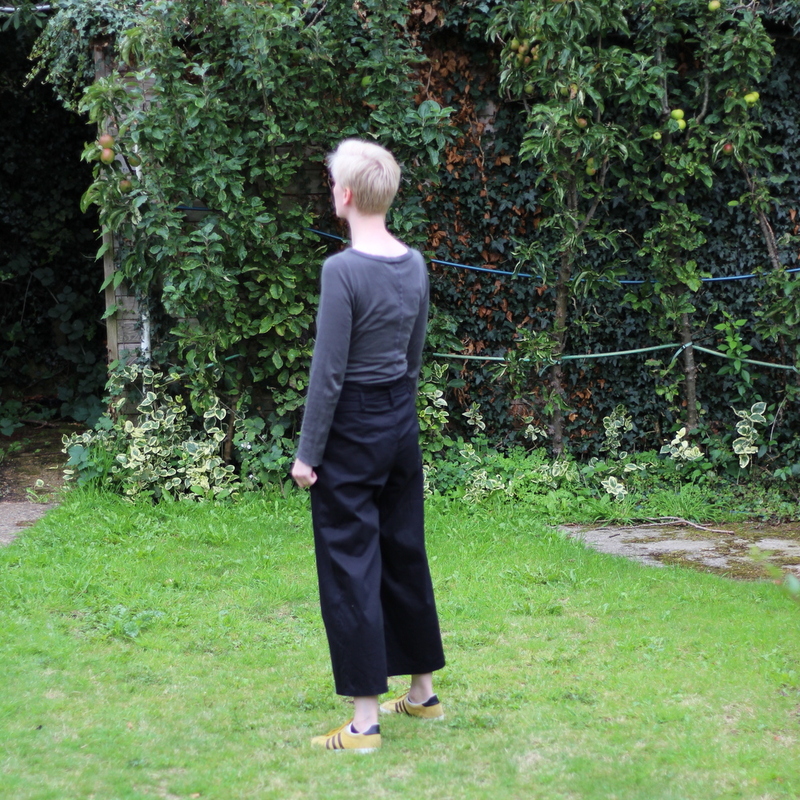 They are more like cropped wide legged trousers than what I normally think of as culottes. Dr T made a great version of this pattern that moved them right to the top of my sewing list. Mine are made in viscose crepe from Truro Fabrics. It’s more drapey than I think the pattern is designed for but it’s what I had in the stash. The fabric requirements say ‘trouser fabrics with some body’. The crepe gives them wonderful movement but some of the details like the belt loops and the high waist would have been better in a crisper fabric. One slightly odd detail is the fake back pockets. I think trousers usually look better with some sort of detail on the backside but there’s something not quite right about these. I think they’re a bit too small and also need to be higher up. But that might not be the pattern’s fault: the whole garment is sitting lower on me than it should. This style of trouser cannot stay in place if there’s any ease in the waist at all; I should have realised that and traced the waist a size smaller than I did. As it is the whole thing slips down a few inches on me. The really good thing about these are the huge hip pockets. They look fine even when fairly full of junk because the style is so voluminous. The tie belt is nice too although it’s come out much longer than I expected. I usually cut them a little longer than the pattern suggests but I don’t remember adding that much length. Unless I tie a bow the ends are down by my ankles. Dramatic, but not the most practical of features. 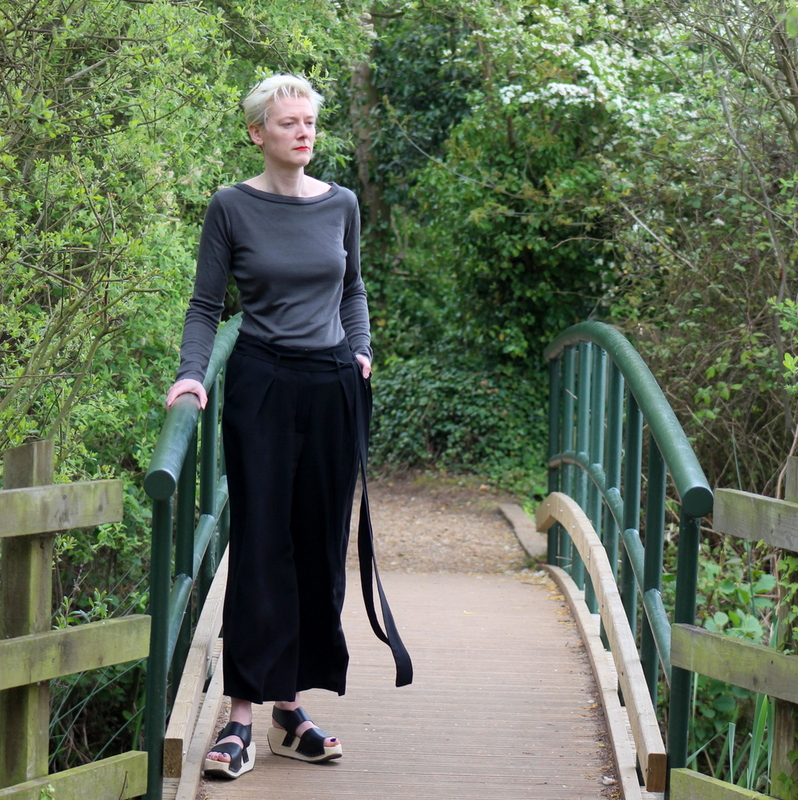 I interfaced the waist facings and fly underlap with Vilene F220 and used a mystery lightweight stretch woven interfacing on the pocket edges. I could have done with putting lightweight interfacing on the fly facings too and maybe the hem area. I doubt I’ll make this particular pattern again soon but I love the wide legged silhouette. I’ve got my eye on a few other Burda patterns with a similar shape.